The global natural source vitamin E market is expected to be extremely consolidated and is filled with several players, among which a few of them lead the global market. Key players operating in the global natural source vitamin E market are BASF SE (Germany), DSM N.V. (Netherlands), Archer Daniels Midlands Company (U.S.), Beijing Gingko Group (China), Wilmar Spring Fruit Nutrition Products Co. Ltd. (China), Davos Life Science (Singapore), Fenchem Biotek (China), Zhejiang Worldbestve Biotechnology Co., Ltd. (China), Eisai Food and Chemical (Japan), and Riken Vitamin Co. Ltd. (Japan). According to a report by Transparency Market Research (TMR), the leading 4 firms in the market held around 58% or more share, back in 2015. The key player DSM N.V. makes 23% of the entire market. The other three key players are BASF SE, Archer Daniels Midlands Company, and Wilmar Spring Fruit Nutrition Products Co. Ltd. Strategies such as partnership and mergers and acquisitions are expected to help strengthen the market scene within the forecast period from 2016 to 2024. There are two types of natural source vitamin E in the market, namely tocotrienol and tocopherol. Among these, tocopherol is likely to dominate as far as revenue and demand are concerned. The tocopherol segment accounted for 65% of the market back in 2015. The market for natural source vitamin E is flourishing in Europe and North America. 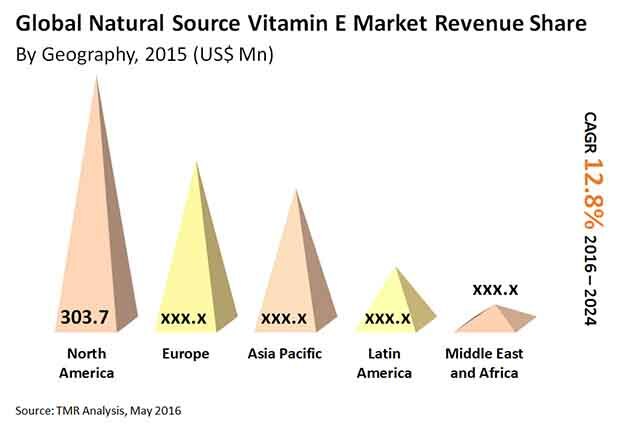 The market for natural source vitamin E market in North America was accounted for over 40% in 2015 and 26% in Europe. The growing awareness about having a healthy lifestyle are some of the contributing factor behind it. Vitamin E has a great effect on individual’s health, right from regulating serval process for example blood pressure and reproduction, to prevention from diseases such as heart ailment, tumor, and dementia to some extent and preventing cell damage. In the previous few years, sedentary lifestyles, rise in elderly population, and unhealthy diets, have led to a surge in cases of chronic diseases, for example, cardiovascular diseases, diabetes, and a variety of tumors. The scenario has stimulated the need for the intake vitamin E with the help of supplementary sources. The easy accessibility of natural source vitamin E through an increasingly strengthening distribution network is additionally a key factor driving the market all over the world. Having successfully established a large consumer base through store-based retail channels, for example, supermarkets, health shops, hypermarkets, drugstores, mass merchandisers, and healthcare specialist retailers, the attention is currently on strengthening the e-commerce channel. In the next few years, a large number of natural source vitamin E products manufacturers will be seen exploiting the well-settled marketing space of e-commerce, making it one of the most lucrative retail channels in the market. The high cost of vitamin E products are expected to be a notable hindering factor for the overall market, especially for the price-conscious masses all over developing economies. Numerous vendors are indulging in research and development initiatives aimed at exploring alternative sources for delivering deodorized distillates. However, no significant results have been obtained. The easy accessibility of natural source vitamin E through an increasingly strengthening distribution network is additionally a key factor driving the market all over the world. In the next few years, a large number of natural source vitamin E products manufacturers will be seen exploiting the well-settled marketing space of e-commerce.